Round tabletop is part of the HON Preside Series that is designed to enhance collaboration from private offices to boardrooms. 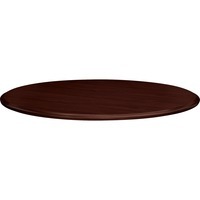 Pair this tabletop with the Preside Queen Anne Base sold separately to create an elegant table for your executive office. High gloss worksurface is top grade, abrasion resistant and stain resistant laminate. Styling includes a tri oval edge. Tabletop and base are sold separately. Tabletop meets or exceeds applicable ANSIBIFMA standards.